Best Three-Point Display by a Nine-Year Old: I don't put minors' last names on the Internet for security reasons, and this young man's first name is distinctive enough that I'm not going to mention it either. He started helping with his dad's trees when he was four, and has been learning right along. 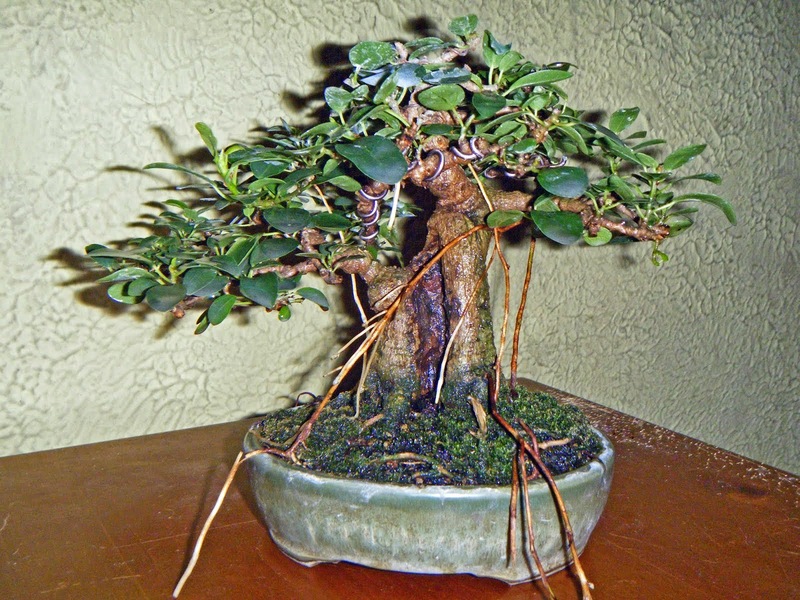 His dad told me that he grew the primary bonsai, the Ficus burtt-davyi, from a cutting; trained it on the rock; picked a pot for it and potted it up; picked out the secondary bonsai, the accent plant, and the stands for all three; and set up the 3-point display. All of that by himself. His dad's only contribution was to let him use one of his spare pots. Not bad at all! Sometimes a child enjoys a certain activity primarily because it is something to do with Mom or Dad. Nothing wrong with that. But this boy's father thinks his son's interest in bonsai may be something that will continue well into the future. If so - who knows how good he'll be by the time he reaches the age some of the rest of us are now? Best Hobbit Tree: I made sure to get a picture of this one for my wife. Some years ago I had a mame-sized Chinese privet (Ligustrum sinense) with a hollow trunk. It was her favorite among my bonsai; she called it my "hobbit tree!" Best Deciduous Runner-up (in my judgment): Actually, had it been up to me, I might well have given this hornbeam the "Best Deciduous" award, not just "runner-up." A powerful trunk with a bit of movement; a healthy canopy that's full but still lets the eye in; a stable nebari (tho it could stand to be more balanced, maybe with some grafts); that uro on the left (that you can't quite see all of, so your eye wants to probe deeper); and a very well-matched pot. I like it! I'd love to have a tree this good! And here I thought it was simply a full, healthy bonsai with lots of deadwood! Maybe that's what a tanuki is supposed to look like. Best Monkeyin' Around Bonsai: I leave you with this composition by Jim Doyle. Little comment is needed - you're probably laughing too hard anyway! Jim had a little sign beside it asking, "Who climbed the tree first - men or apes?" Nothing wrong with mixing a little whimsy in with your art (and your philosophy)! California redwood, Sequoia sempervirens, in custom-made container. Plasticopithecus in the branches.